The apple is the most universal, temperate fruit cultivated in the world. Its ancestry is considered to have originated with Malus sieversii, which grows wild in the Heavenly Mountains at the boundary between western China and the former Soviet Union. From Asia, apples spread throughout Europe where they were grown by the Greeks and Romans in the third century B.C. Today apples are cultivated around the world. The popularity of apples arose because of the many ways that they can be consumed and because of their convenience and durability. More than 10,000 cultivars are documented worldwide yet only a few varieties are commercially produced. Some of the most popular cultivars in the world include: Golden Delicious, Red Delicious, Jonathan, and McIntosh. The world produces close to 65 million tons of apples a year. America alone produces 11.8 million tons a year. The BYU-Idaho Orchard was planted in 1980 under the direction of Dr. Black of the Horticulture Department. It was planted to test apple varieties and research apple rootstocks that would be hardy in the Upper Snake River Valley. Over 150 varieties of apples were originally planted, but in 1984 Rexburg experienced a severe winter with temperatures dropping below -40 F. Many of the apple trees died except those that had Antinovka rootstock, a hardy, Russian rootstock. Immediately after that winter Dr. Black replanted the orchards with rootstocks from Russia and Ukraine to ensure the orchard could withstand the winters in Rexburg. Today the BYU-Idaho Horticulture Apple Orchard is registered as a genetic repository of apples. The orchard contains over 120 varieties of apple trees, some of which are very rare and originate from France, England and Russia. The genetics in many of these trees date back to the 1600-1700s. The orchard additionally contains other fruit trees like pears, cherries, plums, peaches, and apricots. 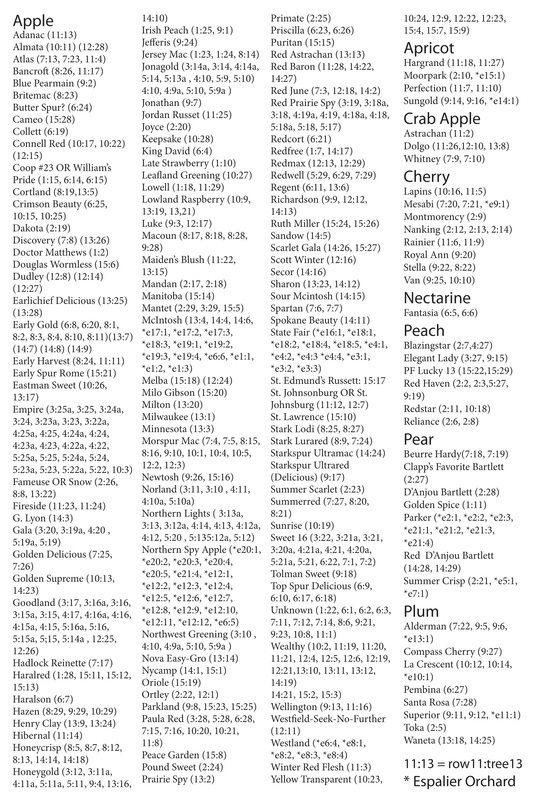 Overall this collection of 160 fruit trees is unique in the United States, especially in the Inter-mountain States where it is the only one of its kind. In the quiet reverie of this well cultivated history, the orchard continues to be an outdoor learning center where horticulture techniques are taught and practiced. • Two-thirds of an apple's fiber, plus lots of antioxidants, are found in the peel. Fruit trees are wonderful additions to a landscape and can be grown in rows like a traditional orchard or in restricted forms like an espalier garden. Some of the most glorious structures in a garden are the free standing fences or screens created by espaliered fruit trees with their plump, ripe fruit visible in attractive forms. Growing fruit trees in a restricted form is a time-honored gardening practice dating back thousands of years from the gardens of pharaohs in Egypt to great monastic gardens and castles carefully trained by monks. Restricted form trees gained wide spread popularity in England and France in the 1600s appearing in humble villages as well as the walls of the Palace of Versailles. In colonial America espaliered fruit trees were grown by George Washington at Mount Vernon and Thomas Jefferson in Monticello. Restricted tree forms are preserved and enjoyed as beautiful art forms in the home gardens and in grand gardens around the world. Espalier: A tree is trained to grow against a wall or independently in a two dimensional shape with multiple tiers. A tier is a level at which two horizontal branches are allowed to grow (see table 3). Cordon: Training fruit to grow along a single trunk with no side branches, many times planted at 45° to enhance fruit production. A Belgium fence is an example of multiple cordons being grown together to form a living fence (see table 5). Fan shape: A single trunk is trained with branches radiating out in a two dimensional fan pattern. These trees can be grown against a wall or trellis (see table 3). Pruning fruit trees in restricted forms produces superior fruit because they receive optimal sun and air circulation which helps control pest problems and their compact form can be grown in protected areas such as along walls where they are kept from frosts and severe weather. They bring versatility and add ornamental beauty to small and large spaces and also produce flowers and fruits more abundantly per square foot than a traditional tree (see table 4). Pears and apples can be grown in all three traditional shapes but plants like peaches and cherries do best in fan shapes. At the east of the orchard in the Espalier Orchard Garden you can see demonstrations of these restricted forms. Additionally you can train fruit trees into various shapes and forms called topiary. Topiaries are a creative way to make fun and varied landscapes. Trees are shaped into circles, squares and triangles through pruning practices. Trees can also be trained into trellises to create an entrance into a garden or replicated to create tunnels and living gazebos. All of these forms are demonstrated throughout the Apple Orchard Museum, Annual Trial Beds, and Espalier Orchard Garden.